I just finished putting together a new build using a Xeon E5-1620 v4 with a SuperMicro C7X99-OCE-F Motherboard. The unit posts just fine and I am able to start the process of loading UNRAID but eventually the server just hangs at the following screen. Ran Memtest overnight and it came up clean. tried both Legacy and UEFI boot methods. re-installed UNRAID on the USB Stick several times using both MacOS and Windows Installers. I also tried an old school manual install. verified that the USB stick had a good install by using it to boot another server temporarily. I am not sure where to go from here. Any thoughts or suggestions would be most appreciated. Thanks in advance for your time and help! Just realized there is a BIOS update. I will report back if it helps. I would still love any input anyone might have to offer. BIOS has been updated and the problem persists. Still can't get past the screen that I attached in the original post. Does anyone have any thoughts? Does anyone know if the text on the attached picture point to anything in particular that I should try? I am at a loss of what to do next over here. I've helped people put together 10+ UNRAID systems over the last nine years and I have never run into a problem like this one. Seems hang on EHCI init USB2.0, so odd, pls try tunning some USB parameter in BIOS. 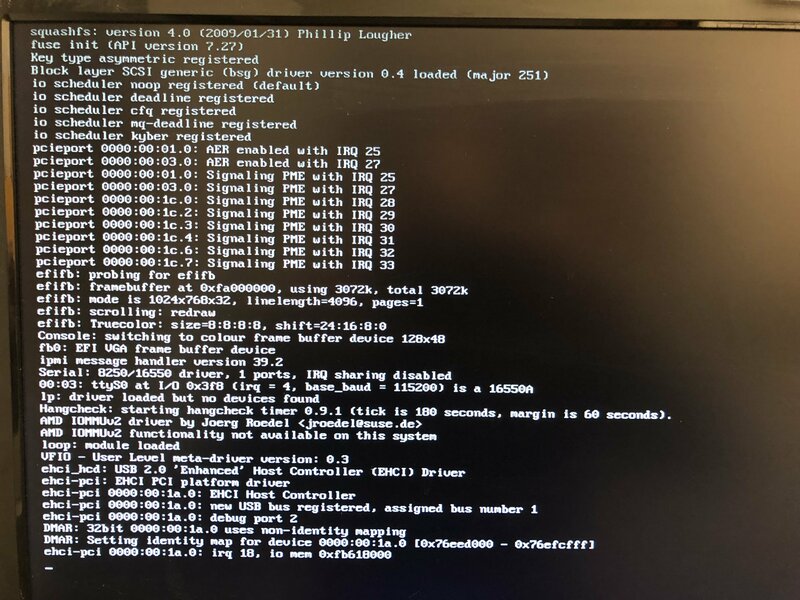 Does hang in safe mode or array not start ? Thanks for chiming in. Safe Mode doesn't make a difference. Unraid never fully loads so the array never even has a chance to start. I have tried a 6.5.3 and 6.6.6 and both hang on the same spot listed in the attached screenshot. How about if remove other USB device ? Yes, no keyboard mouse. Good news! It has finally booted after 3 days of beating my head against the wall. I remembered that I have another server on hand that uses the same type of memory, DDR4 2133 ECC, so I borrowed a stick and the damn thing booted up. So I went back and tried the two sticks individually and both caused the same error with UNRAID hanging while loading. This is really confusing considering that the original memory ran for 12+ hours via Memtest with no issues. For posterity, removing all other USB devices didn't fix this issue for me. I also tried disabling all of the other USB controllers as well as changing other various BIOS settings related to USB and nothing resolved this issue. In the end the memory is either bad or incompatiable. Shout out to Benson for joining in the fray with me! Thanks! How do I change the title to solved? Edit the first post and put (Solved) in the title.